The Split Crow Sail Bag was made for Dennis’ birthday. It is made of sailcloth from the SV Orient Express, a sailboat that our friends Jim and Sharon owned. Its claim to fame is that it raced the Chicago to Mackinac Island race. I don’t know how it placed but its sail is now being used to make bags. We went to Port Carling the other day so that Dennis could sell some of his bowls at Muskoka Living Interiors and the ladies were excited to see the bag and they would like me to make some for them. We got carried away and started taking a bunch of pictures of the bag posed in their shop. We thought that we might take pictures of the bag on our trips – kind of like “Old Pink” but without Dennis. Could be fun! 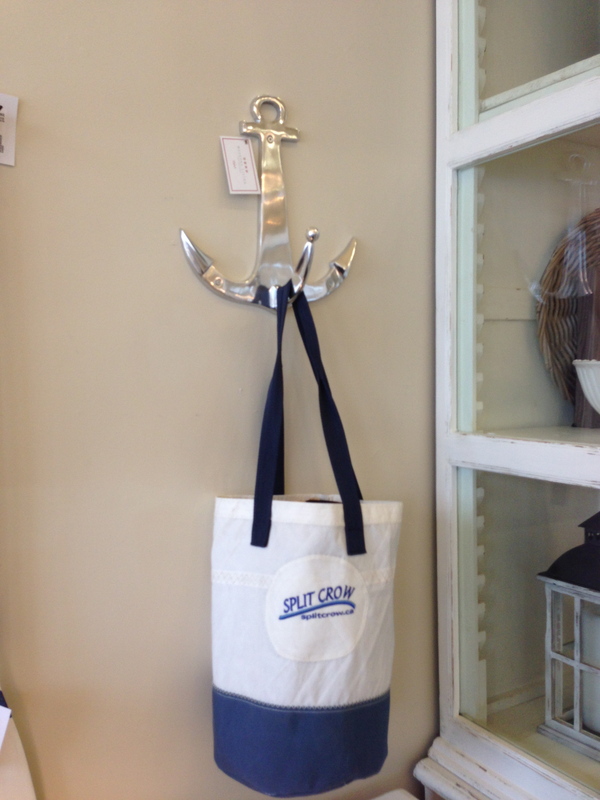 Anyway, this is our picture of the Split Crow Sail Bag visiting Port Carling. For more pictures of bags that are similar to this one, go to Bowls and Bags. Posted by JH on March 9, 2013 in Everything Else! Wow! What a great way to re-purpose an old sail! The Orient Express raced the Mac from 86-91, before we owned her. I believe she won in her division one of those years. She was a great boat. So glad that her old sails have gone to a good home! Yes, the bags have been fun to make! I made a few, one for Dennis too! We are reading your sailing blog where are you stopping tonight?